What does it actually feel like to go on a Mount Kilimanjaro hike? Since your body has to deal with varying weather patterns, changing elevations and high altitude summiting, climbing Kilimanjaro can either mess with your system or have very little effect on it. The tricky thing is, you never know which one it’ll be. So, it’s important to be as prepared as possible. In this guide, we’ll be discussing everything you should expect your body to experience on your way to Uhuru Peak. And then we’ll also cover what won’t happen on this epic excursion later on. While novice hikers may think the biggest hurdle your body has to overcome is the physical climbing of the highest mountain in Africa, it’s really the altitude. Anything higher than 8,000 feet in elevation (or 2,439 meters) is considered being at high altitude. Mount Kilimanjaro clocks in at an elevation of 19,341 feet so it’s definitely up there. 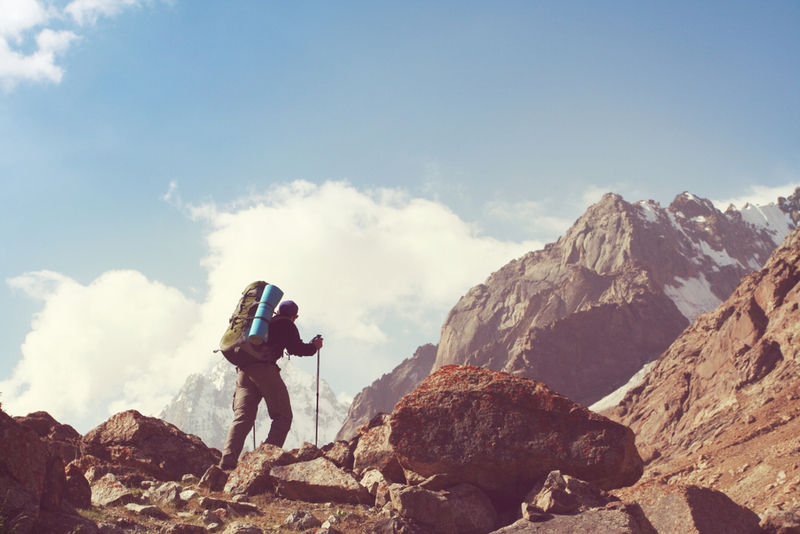 But what does being at high altitude mean for your body? When you’re at sea level, the air pressure causes oxygen molecules to squish together and saturate the air with a plentiful amount you can breathe. Each inhale you take delivers a bunch of oxygen to your lungs. At higher altitudes, however, the air pressure causes the oxygen molecules to spread out. So now that same inhale means you’re getting fewer oxygen molecules inside your lungs per breath. Since your body is used to working with more oxygen at sea level, it’s going to naturally try to compensate and get the same amount at higher elevations. When you get to 12,000 feet, it will feel as if you have 40% less oxygen for every breath you take. So you may feel short of breath, or like you can’t catch your breath, because you’re not getting as much oxygen as you normally do per inhale. As we mentioned, this will cause your body to increase your respiratory rate or the number of breaths you take in per minute, to try and force more oxygen into your lungs. Many hikers choose to bring Diamox to summit Kilimanjaro because it helps your body breathe deeper and faster to allow more oxygen into your bloodstream. And since your lungs will be doing all this extra work, your heart also pitches in to help move that oxygen around your body. As your body adjusts to higher altitudes, your heart will beat more times per minute to transport more oxygen. The faster your blood pumps, the more oxygen gets supplied where you need it most. As a way to acclimatize to the decreased oxygen levels, research shows your body will create 30-50% more red blood cells as soon as the first night you spend in a high altitude environment. Red blood cells carry oxygen in your blood, so this is a big help. Plus, your body also boosts production of capillaries, which shorten the distance between red blood cells so it’s easier for oxygen to move around. To keep up with your increasing demands for oxygen, a few other organs may get ignored in the process, as we’ll see next. Your body will direct all power and oxygen to where it’s needed most on your climb, i.e., your brain, lungs and heart. But that means you may experience headaches as a result of this rush of blood to the head, so to speak. You may also notice swelling in your fingers and feet. That’s why you should leave your rings at home and never hike Kilimanjaro in new boots, which may cause blisters as your feet swell on the trail. Your body will also route less blood to organs not in heavy use during your climb, such as those in your digestive tract. This may cause nausea, loss of appetite, bowel changes and possibly even vomiting. But diarrhea could also be a sign of this next change. #4. Dehydration and dry skin. Dehydration at high altitude is very common, thanks to your increased respiratory rate, physical activity and the weather on the mountain (like humidity or very dry air). When you get above 6,000 feet in elevation, your body sweats twice as much moisture as it does when you’re at sea level. To make matters worse, the low air pressure evaporates what little moisture your skin does have so you’ll notice drier skin too. Plenty of water and a lightweight moisturizer will be your best friend here. In addition to your CamelBak or Platypus, you should also bring hydration salt tablets to add to your water to prevent dehydration and ensure your electrolytes are always properly balanced. You may think all this long trekking should bring a good night’s sleep. But some hikers experience trouble snoozing due to the high altitude. Your body will start shedding excess body weight via urination so you may find yourself waking up in the middle of the night to use the restroom. Other times, your body may forget to breathe deeply while you slumber so your brain will wake your body up to make sure it performs this critical function. Did you know going for a walk in nature increases creative thinking? On the trail in the wonder of Kilimanjaro’s splendor, you may find your brain bursting with ideas. With no one from home to spill them to, you should bring a tiny notebook so you can write down your thoughts and reminisce later. Now that you know what may happen to your body on a Kilimanjaro hike, let’s talk about what you shouldn’t fear. If you’re an avid hiker or explorer, you know the punishment one’s body is able to endure in the name of adventure. #1. Losing a crazy amount of weight or body fat. Hikers who make their way across the AT, PCT or any other long hikes take weeks or months to finish their journey. That’s why they see staggering weight loss and drastic body composition changes. Though Kilimanjaro is a climb, the longest hikes are still only around two weeks long. You may experience a decent amount of weight loss, but most of that will probably be due to dehydration. Unfortunately, you will likely gain this weight back as soon as you return home to your regular schedule and diet. #2. Dealing with major injuries. Studies show that 60% of trekkers on thru-hikes report at least one injury, like lost toenails, sprained knees, broken ankles, shin splints, or fractured joints on their (very long) way to the finish line. However, that’s not the case for those climbing Kilimanjaro. Our team of experts will ensure you are prepared and safe the entire way up and down the mountain. Major injuries are not common during our treks. Mountaineers refer to altitudes above 26,000 feet (8,000 m) as the “death zone” because it’s widely believed no human body can acclimatize to such low levels of oxygen in the air. Even though it’s the highest peak in Africa, Mount Kilimanjaro’s summit elevation of 19,341′ is nowhere near as dangerous as higher peaks like Mount Everest (29,029′). If you’ve been acclimatizing to the elevation slowly, all those changes you experience on Kilimanjaro will be tolerable for your body. Ascend too fast and you may suffer the consequences of altitude sickness. Acute mountain sickness is all too common at elevations over 10,000 feet (3,048 m). In fact, 75% of people will have mild symptoms of AMS beginning 12-24 hours after they first hit high altitude. Thankfully these symptoms usually go away within 36-48 hours. But it takes a skilled guide familiar with how bodies react to high altitude to make sure you reach the Roof of Africa safely — especially if you encounter complications climbing Kilimanjaro. Tusker Trail was the first company to establish a comprehensive medical training course for all its guides. Designed by Tusker founding guide and high altitude expert, Eddie Frank, the course is recognized by high altitude doctors worldwide and is the standard for high altitude training on Mount Kilimanjaro. With over 42 years of Kilimanjaro climbing experience, our guides know how to spot the six changes your body may experience on your Kilimanjaro hike of a lifetime and help you get through them. It’s our goal to make sure you have the most rewarding trek possible, and that means putting your safety first. So if you’re ready to research your great adventure, check out our 2018/2019 Kilimanjaro climb costs and trip dates next!